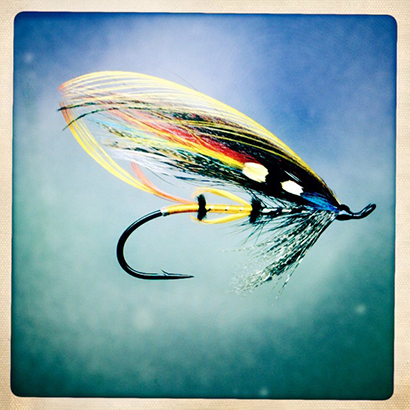 Not to be confused with the rather brilliant contemporary poet of the same name, the Jock Scott is possibly the most famous salmon fly of all. In 1845, it’s creator (it is named eponymously) was travelling by boat to Norway, which was and still is one of the finest places in the world to catch an Atlantic salmon (see Fish we Like). Scott was a noted fly-tier, and served as Fisherman to Lord John Scott for a quarter of century. His aim was to create a fly that no self-respecting salmon would resist having a snap at. He succeeded. Using a variety of feathers Jock tied a fly that offered a cascade of colour. In fact, writer and master salmon-fisher Major J.P. Traherne once said that if he were able to use only one fly to cast for salmon, then he would choose a Jock Scott.